We must be in the cold calm before the spring, because we've got quite a few little potted gardening projects going on around here and we're just waiting for them to burst into their full bounty. Indoor container gardening just might be the only thing keeping us from completely going stir crazy about not being able to get outside in the garden. So, what have we got up our sleeves? In addition to our newly planted horseradish root and pineapple top, this weekend we decided it was high time to start out an indoor potted planter for ginger root. That's right, we're growing ginger root — and we're doing it from a few leftover pieces we picked up from the grocery store a while back for one of my recipes. Ginger is one of those plants with long documented health and medicinal benefits, but for the sake of keeping things real, we've decided to try and grow our own self generating supply since Mary and I just LOVE the taste of it. We're planting these little root nubs with big hopes for future add-ins to recipes, for canning and spirit concoctions. OK, and Mary's excited to see the and use the flowers from the plant. Maybe I am too. A litte. 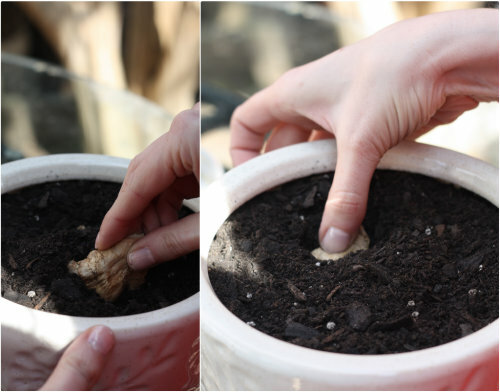 Here's how easy it is to plant ginger root — start with a piece of root from the farmer's market or grocery store and twist or chop off the knobby portions, called "fingers," for planting. You want each of these to grow and expand their own sets of nubby root fingers, so we'll start small. The ginger shoots will eventually sprout and emerge from each of the little nubby areas, called eyes (like a potato has eyes), on each finger section. 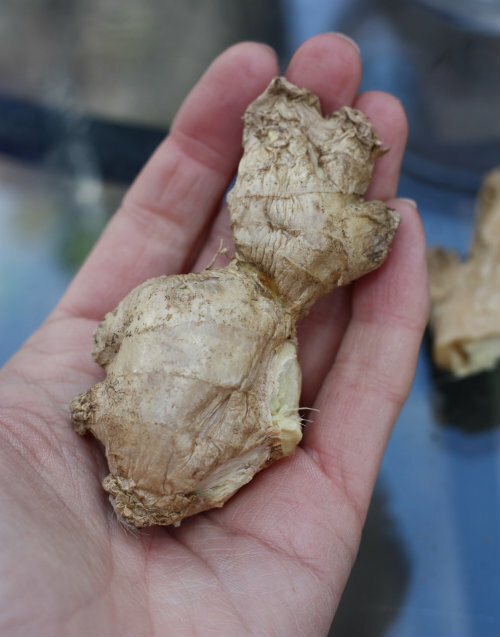 You may find a piece of ginger root that already has these sprouts coming out, or you can even encourage them to do so by leaving them near a windowsill before you plant. You're almost done! Now, you just need to keep the soil moist and warm in a sunny area and watch for growth. 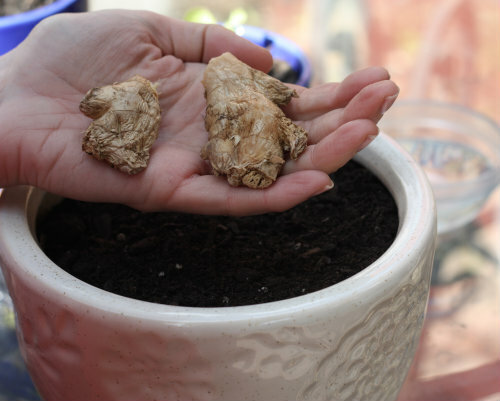 Almost exactly as we explained when planting our horseradish root, the ginger root will grow and expand underneath the soil throughout the growth season. Before you know it, you'll have an ongoing supply of ginger root in your own space, negating the need for you to ever buy it again from the store. 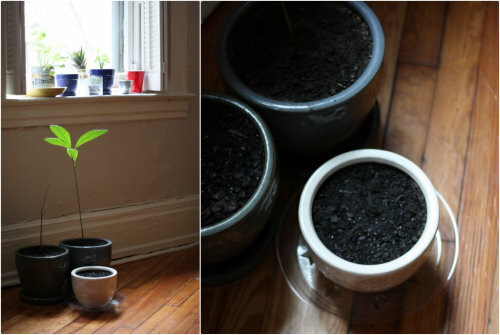 Because ginger plants require more warmth and sunlight, we've brought the container indoors and have it nestled in a little grouping with our two avocado tree plants underneath the windowsill in our kitchen that we've had the most luck with sprouting plantings. If all goes well, with regular waterings and warm sunlight, we should see green sprouts pushing their way up through the soil in the coming weeks. For now, they're just getting all happy in their new home by the window. 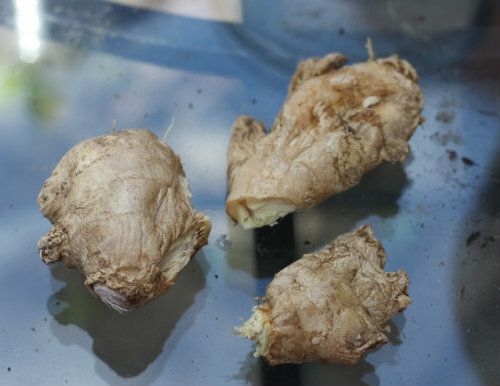 From what we've read, after about 4 months of growing in the container, we should be able to cut small portions of ginger straight from the edge of the root for use in the kitchen — these early pieces will have a milder taste than the more mature root we'll get later in the growing season. We'll be able to fully harvest after about 8-10 months of growth and will look for signs of the plant to be ready for harvesting, like leaves drying and dying away. At this point, we should be able to remove the entire new big pieces of root from the container and break them up for use in the kitchen, storing, and replanting right away in even more planters. So that's how we got our little ginger root container plant started — you can bet we'll keep you posted on it's progress. It was actually such a quick and easy container gardening project, it left us wondering why we haven't tried it sooner! Your gardening tips are my favorite part of your blog - I've already tried several of them! A question for you... We live in the Fan and only get strong natural light coming in from the south in the morning and then the north in the afternoon. Nothing from the sides. Do you have the same issue -- and if so, has that affected your ability to grow successfully indoors? Do you find more success in the north vs the south facing windows? Sometimes I feel like I should be moving my plants throughout the day to chase the few hours of direct sun! I'm going to have to give it a try! Anything to break the cold weather doldrums! We know exactly how you feel! Sorry, I just had to come back and acknowledge the idiocy of my question. Of course the south window will get more sun, given the movement of the sun from east to west. D'oh. I hadn't had my coffee yet. Also, this is probably why I have a black thumb. Lindsay! Too funny — no dumb questions at all. We try moving our plants around but find this one window in the kitchen that's sort of diagonal facing always gives us the best results, ha! Sounds crazy I know! I've tried freezing Ginger, but not with much success. If I froze it whole, it was mushy when it thawed, but if I peeled it and chopped it, it looked withered and dried out. How do you do yours? i just read that you can keep ginger like fresh if you store it in brandy! Grate your ginger from frozen and pop the unused bit back in the freezer. Exactly what I've done. Freeze it, then grate it from frozen, then pop it back in the freezer. It doesn't even need peeled if you grate it. Been doing that for years. How is the Ginger root growing? 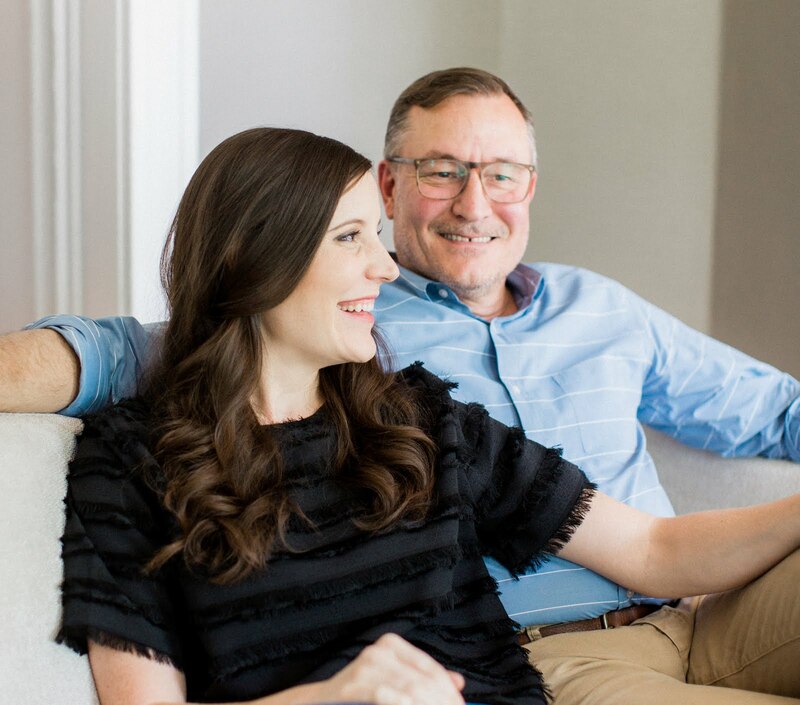 Just wanted to say how much I love your blog! An` when you get ginger and garlic, mince both and mix, do ice cubes, the perfect base for curries, Mexican, Indonesian, Chinese........oh, just everything really.....er, savoury I mean! Can do with your peppers too and save hours, plus cheer and heat up those winter months! Anyone else barking, oops I mean inventive..............? Oh my dear Lord, freezing is a horrible thing to inflict on a ginger root. Forget the refrigerator entirely. If you want to keep a good piece of ginger fresh for your cooking pot, rinse in occasionally and keep it in a small bowl on your countertop. If it shows signs of shrivel (kind of like the pieces you're holding in your hand above, honestly) you can soak them over night, shake them off and put them back in the bowl on the counter. I've tried everything else over the course of years before I realized this is all you need to do... and I was like, "DUH!" It was right around the time that I started a planting. ;) Have FUN! which side is sprout side up, where I broke it? It appears from the photo above that sprout side up is the broken off part - can you please confirm? Thanks!